Makerspaces are popping up across the educational spectrum, at schools, libraries, and youth centers. The Maker Movement has revitalized an interest in hands-on projects and the use of various tools for designing and prototyping. Once-empty school shops and computer labs are being reborn as makerspaces, and the curriculum is gender-neutral so girls and boys have the opportunity to make. Makerspaces are collaborative work spaces with high-tech and low-tech tools. For example, the KCI Makerspace is equipped with 3D printers, laser cutters, CNC machines, soldering stations, and even sewing machines. School districts, libraries, and youth centers now have a need for trained staff to run and manage makerspaces. In response, KCI has launched a new state-approved certificate. The Makerspace Coordinator Certificate is a 10-month, 18-unit program designed for people who are seeking employ¬ment in fabrication laboratories and makerspaces in educational settings. 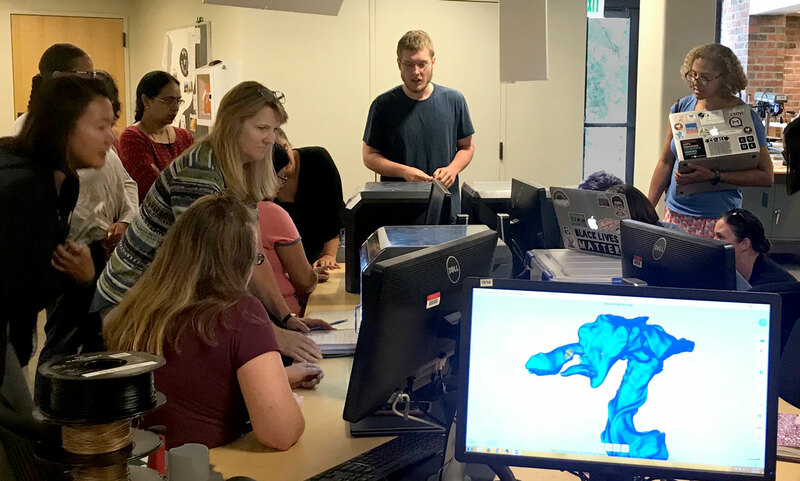 This summer, KCI kicked off two Makerspace certificate programs—one for the general population and the other specifically for women, titled UniDIVersity. Both programs provide instruction and support for building models and prototypes, strategies to spark innovation and invention, and creative problem-solving and collaboration. The 44 participants in both programs have been introduced to design thinking, computational thinking, and physical computing. The certificate is ideal for classified and certificated personnel at schools, community center employees and volunteers, and librarians and library assistants. One of the goals is to support women in taking on tech leadership roles, securing pay raises and breaking through glass ceilings. Mandie Cline, STEAM Coordinator for Ruby Bridges Elementary in the Alameda Union School District, is part of the first UniDIVersity cohort and is enthusiastic about the program: “There’s so much to appreciate about KCI’s UniDIVersity program! At the top of the list is that I now have a strong network of women in STEAM from around the Bay Area to talk to and learn with. This certificate program has strengthened my skills as a professional working in STEAM education and validated the work I am already doing at my elementary school. I’m so proud to be in this program and excited for the next set of classes.” UniDIVersity is grant funded thanks to support from the Morgan Family Foundation.